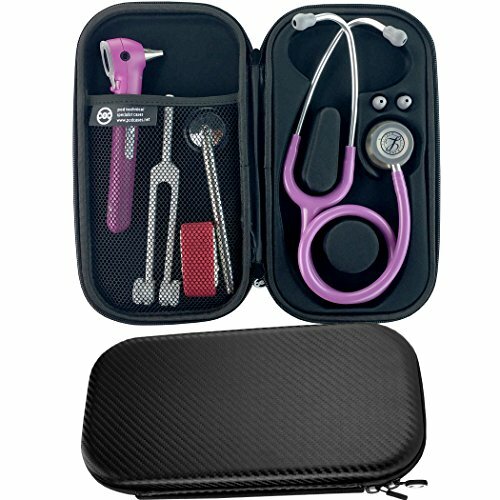 The Pod Technical classicpod carry case is a perfect fit for a Littmann Classic II SE or Classic III stethoscope, Select, Lightweight, Classic II, Infant, Paediatric or Master Classic. Strong protective outer shell covered in 1680D grade nylon, or carbon effect material, for maximum durability. Pre-formed moulded interior keeps your Classic sized scope held snugly in place during transit. Preformed eartip holders for Littmann type large firm, or small soft sealing eartips. The Pod Technical classicpod case has been designed specifically for Classic sized, single lumen scopes. Pod cases, unlike generic cases, have been designed by industry experts, specifically to house your classic sized scope. They offer maximum protection, due to the (removable) preformed interior. This secures the stethoscope during transportation, meaning the sensitive diaphragm and tubing are correctly stored, the way the manufacturer intended. Pod Technical cases represent the very best quality available for stethoscope protection. For Cardiology sized, dual lumen scopes, see our Cardiopod case, specifically designed for larger cardiology grade scopes! If you have any questions about this product by Pod Technical Specialist Cases, contact us by completing and submitting the form below. If you are looking for a specif part number, please include it with your message.